The key is in targeting a specific type of protein. For more than three decades, experts have understood that a gene variant called ApoE4 can greatly increase the risks of the degenerative brain condition known as Alzheimer’s disease by up to 12 times. Now, a team of researchers from the Washington University School of Medicine in St. Louis have found a way to disrupt the growth of ApoE4 proteins — indicating it could one day be used to delay or prevent Alzheimer’s. ApoE4, a variant of the apolipoprotein E (ApoE) gene, is believed to promote the growth of amyloid beta proteins into plaques, known to be prominent in the brains of people suffering from Alzheimer’s. The Washington University researchers found a way to disrupt ApoE4 proteins using a compound from a DNA-based molecule called antisense oligonucleotide. Holtzman and his colleagues tested their compound by injecting it in the liquid surrounding the brains of newborn mice. A control group was given only either salt water or a placebo. Those that received the compound had their ApoE levels drop by half compared to those given only salt water or placebo. After two months, both groups were given boosters, either of the compound or salt water. Fewer amyloid plaques developed in the brains of mice given the compound, and those that did triggered only half as much damage to neurons nearby, suggesting the treatment prevented neurological damage indicative of Alzheimer’s. “Other than lowering amyloid, it appears to lower some of the damage to nerve processes associated with amyloid,” Holtzman said. Their findings are published in the journal Neuron. A number of studies that pursue treatments or methods to prevent Alzheimer’s — a disease that affects some 44 million people worldwide, and over 5 million in the United States — focus on better understanding the mechanisms of amyloid beta plaque development or the proteins that interact with it, like ApoE. 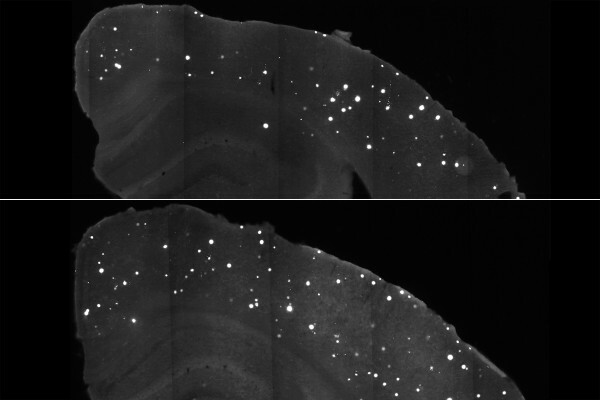 Abraham, on the other hand, suggests that a “combination of treatments that would attack amyloid, tau and inflammation has a higher chance of success.” She and her colleagues at BU School of Medicine are taking a different approach: making “the neurons resilient to beta amyloid, tau and inflammation by increasing the levels of a proven neuroprotective and cognitive enhancing protein, Klotho,” she explained to Futurism. Klotho is a protein that’s known for its anti-aging effects. While both Holtzman’s and Abraham’s teams are yet to proceed into human clinical trials, theirs aren’t the only efforts that aim to defeat Alzheimer’s. Others have focused on coming up with a vaccine or drug — with two already in human clinical trials — while there are those that suggest lifestyle changes. Still some are focusing on understanding the mechanisms that affect the brains of patients with Alzheimer’s. With this widespread research action, it’s possible that we might come up with improved treatments sooner than later.